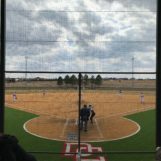 DODGE CITY, Kan. — The Dodge City High School softball team is off to a 4-0 start on the season after two run-rule victories over Hays-Thomas More Prep on Tuesday afternoon at Legends Complex. The Red Demons won the first game 10-0 and then 12-2 in game two. Red Demon senior Raegan Lopp got things started in the circle in the first game and really set the tone. Lopp went all five innings, allowing no runs, one hit and hit just one batter, as only three Monarchs reached base in the game. Raegan Lopp got it done on the defensive side of things, while four Lady Demons had a multi-hit game, led by Caroline Williams’ three hits at the top of the lineup. Dodge City has been lethal in the first two innings of all four of their games thus far, outscoring opponents 30-3 in that span. The Red Demons put up six runs in the first two innings combined in game one against TMP. Zabree Rodriguez hit a two-run home run over the right field fence in the bottom of the fourth inning to extend the lead on the Monarchs and go up 10-0. She finished with a game-high two RBI, while Raemie Lopp and Elise Helfrich all drove in two. Raegan Lopp retired the side in the top of the fifth inning to secure the win and the run-rule victory. The Red Demons scored their 10 runs on 13 hits in the game, while TMP had just the one single. The Monarchs came out swinging in game two and took a 2-0 lead going to the bottom of the first inning. Dodge City would grab one back in the bottom half to trail 2-1 after one. After a scoreless top of the second thrown by Raemie Lopp, the Red Demons had some momentum going to the bottom of the inning. The Red Demons would piece together eight runs in the inning, thanks to a 3-run inside-the-park home run from freshman Mari Landa. After grabbing the lead in the second, they would not look back and wouldn’t allow another TMP run. Dodge City put together 15 more hits in the second game and were led by Raemie Lopp, Caroline Williams and Regan Gerber’s two hits apiece. Lopp also added two RBI’s, as did Helfrich. Raemie Lopp went three innings to grab the win, allowing two runs, two hits and striking out three Monarchs. The Lady Demons improve to 4-0 on the season and will travel to Wichita to take on the South Titans with first pitch set for 4 p.m.